Kirk Cousins finished his career at Michigan State as MSU’s all-time leader in PASSING TOUCHDOWNS (66), PASSING YARDS (9,131), COMPLETIONS (723), PASSING EFFICIENCY (146.1 rating), and TOTAL OFFENSE (9,004 yards). He is one of only two three-year captains in MSU football history. 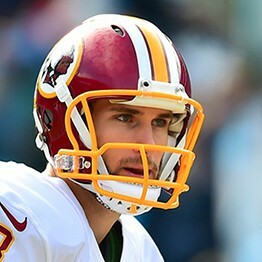 Drafted by the NFL’s Washington Redskins in 2012, Kirk led the team to victory in his first career start and finished his rookie season with a quarterback rating of 101.6. Kirk has now completed 4 seasons with the Redskins. Kirk and his wife Julie split time between Asbhurn, VA, Atlanta, GA and Holland, MI.